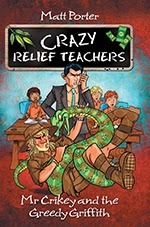 This is the fourth book in the Crazy Relief Teachers series. Class 6B has been missing a regular teacher for a while, and have had a string of oddball relief teachers. This time it’s Mr Crikey, a wildlife warrior who dresses in khaki. He offers to help the students save their swimming hole and the surrounding bushland from developers, but how can they raise the money in time? Enter Benjamin Griffith, a businessman who buys shares in Class 6B and rents out their storeroom as his office. This is an entertaining read – fast paced and funny, with just the right amount of silliness that will appeal to kids. The main adults in the story are of course stereotypes, but the kids are quite real and relatable. Although it’s a pretty chaotic learning environment, this students do learn about the stock market and shares, and are able to put this knowledge into practice. This book is suitable for middle to upper primary and should have wide appeal, though the cover may appeal more to boys. Recommended for primary school libraries.